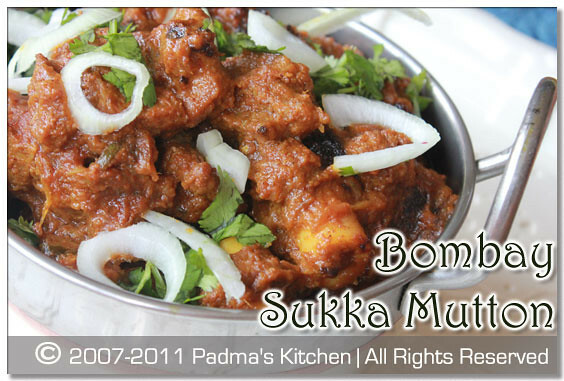 One of the favorite Mutton entree to order in Mumbai (Bombay) restaurants is Sukka Mutton. This recipe is from the coastal Mumbai community popularly called as "Koli" alias fishermen. 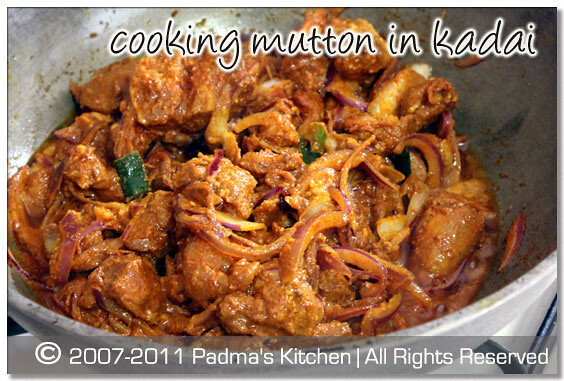 'Mutton" in India is predominantly referred to Goat meat and Lamb meat in some parts. This wickedly hot Mutton Sukka or popularly called as Bombay Sukka Mutton is so yummy that you want to stuff yourself till your completely choke!!! I love to have this with hot steamy basmati rice..
You will find many different recipes on Sukka Mutton in the foodie blogosphere. But this one I grabbed it from local television channel showcasing the Koli food. I immediately fell in love with this recipe and cooking almost every Sunday. The recipe is very simple and easy to make. I bet you will keep licking your fingers in the end. Simple procedure to follow while cooking: (1) Firstly cut the goat meat into bite size with the bones too! Marinate with onions, turmeric powder, red chilli powder, salt, lime juice for about 30-40 mins ahead. (3) Cover with a steel plate, pour water on the lid plate and let it cook. Included photos for step by step photo demo to clearly understand the procedure. Cut and clean 1.5 pounds of goat meat(alternatively you can use Lamb meat) into bite size pieces along with the bones. Rinse once in running tap water, drain any extra water by rinsing it in a colander. Transfer the meat into big bowl and add 1.5 to 2 cups of diced red onions as seen in the above picture. To this add the rest of the ingredients listed under marinating the mutton. Keep it aside for 30-40 minutes. Upon marination take half cup of oil, yeah you read it correctly its half cup only. This adds flavor to the dish so leave aside your calorie counting for one day. Since we are not adding water the meat cooked in the oil only. Heat on a medium flame. When the oil is hot add curry leaves, green chillies and the marinated mutton and mix well. Now cover it with a steel plate and pour enough water into it. Keep the flame to medium and let the mutton cook undisturbed for 15 mins or so. After 15 mins check for water on the lid, it must be evaporated!! check the mutton, you can see the water on sides its normal, now check for salt and add paprika powder. Cover the lid and add more water, cook for another 15 mins. If you check now the water in the meat is dried up little bit, check to see if mutton is cooked, not a chewy bite but the meat should fall off the bone, if not cook for another 10 mins and you are done. If you have a thin gravy like curry then fry the mutton on high flame till all the liquid evaporates. Enjoy and have fun with your food!! P.S: If you are in Mumbai and want to taste this Mutton Sukka then you can go to Sachin. Corner View Building, Gokhale Road (North), Dadar, Mumbai 400028. Tel: +91 (22) 24466625. Open: 11.30 am – 3.30 pm, 7 pm – 10.30 pm. Thursday closed. No Credit Cards. I bet you will be drooling over the hearty homemade seafood menu too! Mouthwatering pictures! We love mutton but have stopped eating it as we are trying to eat healthy! 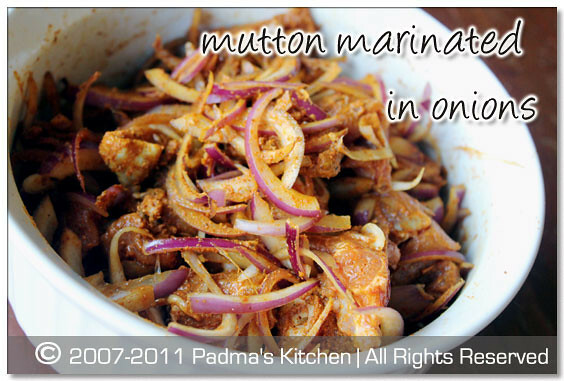 Will try it the next time I make mutton and if I can convince my husband to eat some fry. He prefers gravies to dry curries. Its very tempting...i just loved the way you explained and information at the end..
By the way you got just awonderful blog with delicious receipes...going to bookmark your blog in my list. Nice to visit your blog. 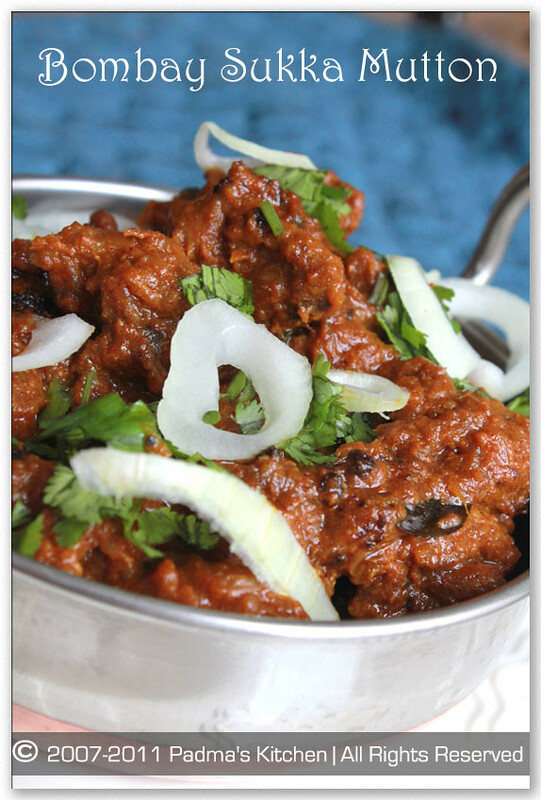 Mutton looks spicy, delicious and tempting. I appreciate for your wonderful presentation. i am going to try it! When to add the sambhar masala though? Thanks Usha... yeah u can try, once in a while red is good, coz of iron n protein in it!! By the way the curry becomes dry in the end... what you saw in the pictures were dried out gravy!! Omg, am drooling over that sukka mutton,simply irresistible..
Really nice and easy recipe.I am definately going to try it.But what is this Prabhu Sambhar masala is it a packed masala which I can get at my grocery store?.What other substitue can I add if I do not get this masala here in Australia? 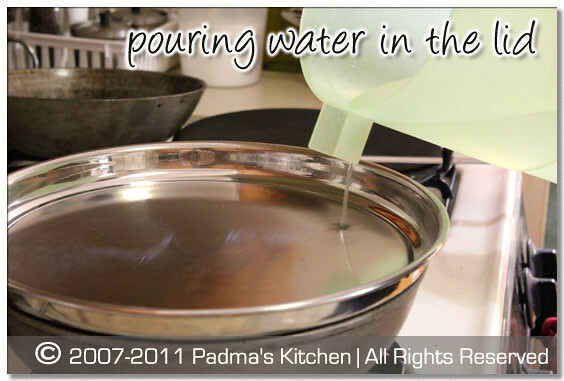 Pathare Prabhu Masala is the Trademark Masala of the Pathare Prabhu community. This community is the one of the oldest settlers of Bombay. We are CERTAINLY NOT the KOLIS or the AGRIS. Please get your facts right before posting them. Just made this today and turned out excellent. However, even though I got the bakri id ka mutton, it was pretty tough and took very long to cook.